Sorry this one’s a bit later than usual, but this is because… well, let me tell you the storye. so i was in town doing a bit of christmas shopping (well mum was, i was basically looking around the cool shops like hmv and that, see what i want for christmas), and then something odd happened. and he knows all about this advent calendar, cause he’s the one who sold it to me! and then suddenly right, and just entirely out of the blue yeah, there was this totally mank power cut! So it’s all black in there yeah, like when it’s that dark at night that you have a go opening and closing your eyes to see how there’s just basically no difference. And there was this strange sound, like something from another world! and then at this point they obviously sort it out because the place lights up again and people start walking about, and over in the corner was danny john jules and some mates doing a song, and then you’re not going to believe this but the chinese bloke’s shop yeah, now there’s a little display stand I hadn’t seen before, and it’s just got a bit of paper on. And I’m like right, I definitely know this wasn’t here before. But I nicked it from him anyway. And i got away with it too. The coming of the Herald… what on earth does that mean…? So! I’m bkac home now and I’ve got the calendar here, and let’s see where the door for number – what is it now? 13? Where number 13 is. 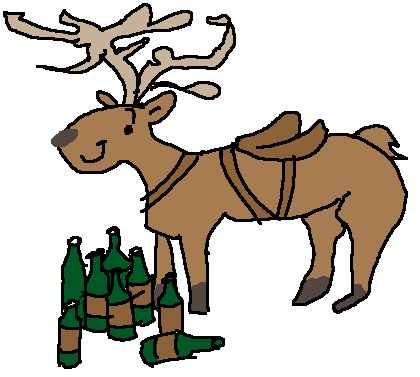 Oh right there it is, today’s door is on the moutain of booze bottles lying at the foot of one of the reindeer look. And I knoe what’s going on here as well. Mum’s not watching today but i did look into that book she gave me anyway, because it looiks like the book knoes about more or less everything on the calendar. 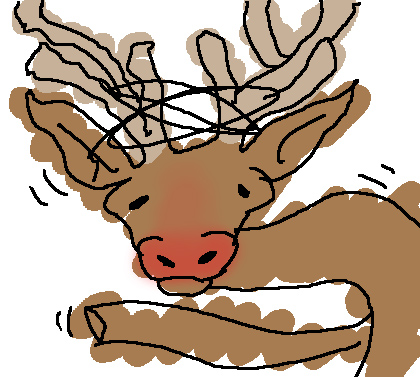 So this reindeer apparently, He’s fine now but by the time all the reindeer grow up he gets into a serious alcohol problem and all of the other reindeer generally laugh and call him names. BUT THEN SNATA SAVE HIM , and then puts him through a rehabilitation course and eventually he’s sorted. Isn’t sanat great! O sorry. I should say that my mum raised an issue yesterday. She said that because I’ve been a bit messy and keep spelling Santa wrong, people might think that i’m leading you up a merry garden path or something, i can’t remember what she said. but basically it was that she was worried ppl will think that I’m going to reveal at the end that I’ve actually been mis-spelling satan instead of snata. So listen up cause i’m here to tell you now that is not the case. I’m talking about the Santa Claus with christmas and presnets, and all that. Just before anyone gets all clever and thinks this is going somewhere it’s isn’t. so let’s have a look at that door then. A teeny weeny mutter of utter gutter splutter butter! I was enjoying this a lot, and then you made a “Little Shop of Horrors” reference and I just about had a groke. That’s like a stroke, but from geeking out. Seriously, this is amazing and I wish I experienced it as it was happening!